Mark Simpson and Kris Bennett each had a goal and two assists, and Stephen Anderson scored twice to lead the UNB Varsity Reds to an 8-1 win over the Concordia Stingers in the second quarter-final game of the 2018 U SPORTS Cavendish Farms University Cup. 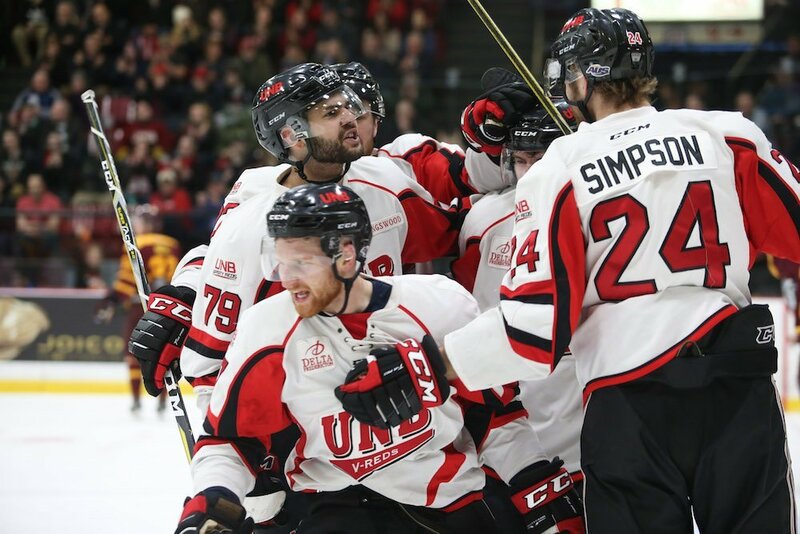 Randy Gazzola, Chris Clapperton and Alex Goulet each had a goal and an assist, while Cam Brace had a pair of assists as UNB advanced to the semifinals in front of a sold-out crowd of 3,374 people. “We have the best fans in the country… our team is the most excited we’ve been all year and I think it showed in the first period,” said Simpson. Prior to the game, the tournament’s opening ceremonies were held, along with a ceremonial faceoff which included members of the Canadian Armed Forces. Clapperton put the Varsity Reds on the board first, scoring off a behind-the-net pass from Simpson. Simpson followed just 2:46 later with a goal of his own, off a perfect shot to the top corner. “He plays a 200-foot game,” said UNB head coach Gardiner MacDougall when asked about Simpson’s performance. Gazzola put a point shot through traffic with just 30 seconds left in the first, extending the Varsity Reds lead to three. The second period was scoreless, despite the play being entirely in favour of the Varsity Reds, who outshot Concordia 18-3. Concordia goaltender Marc-Antoine Turcotte made a number of key saves to keep the game within reach. “It’s not easy when you’re on the other side, but it’s a good lesson,” said Concordia head coach Marc-André Élement. Turcotte was replaced by backup Antoine Dagenais to start the third, after leaving with an injury caused by a shot he took to the head in the second period. The Varsity Reds pulled away in the third, scoring three power play goals in a span of 1:41. Bennett scored on a rebound off a one-timer by Gazzola, with Anderson following just over a minute later, burying a loose puck in the slot. Matt Boudens added the sixth goal, just 39 seconds after that, on a backhand shot in close. 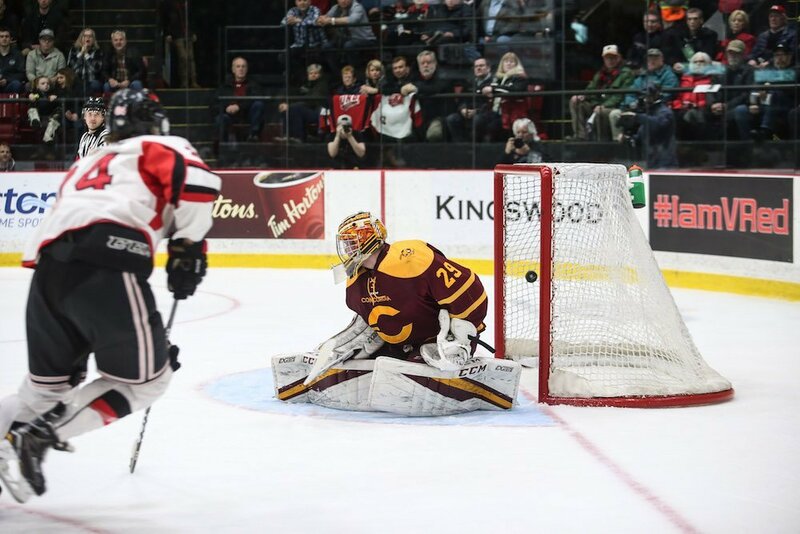 Concordia’s Anthony Beauregard, named the U SPORTS Player of the Year on Wednesday, broke the shutout bid, but that’s as close as the Stingers would come. In the final 10 minutes, Goulet restored the six-goal margin and Anderson added his second to push it to seven. The Varsity Reds outshot the Stingers 52-17. Players of the game were Mark Simpson for UNB and Massimo Carozza for Concordia. Alex Dubeau made 16 saves in the win for UNB. Turcotte made 30 saves on 33 shots, while Dagenais made 14 saves on 19 shots in relief in the Concordia net. UNB went 3-7 on the power play while Concordia went 0-7. Concordia, the second team to be eliminated from the tournament, was playing in the University Cup for the first time. 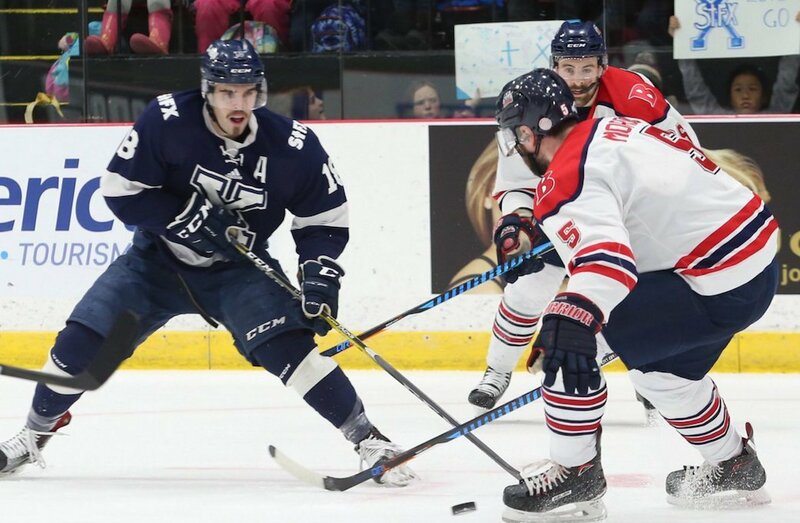 UNB will now face rival StFX in the first semifinal on Saturday, at 11 a.m. ET / 8 a.m. PT.